An international team of scientists boarded the research vessel OGS Explora in the port of Hobart, Tasmania, on 19 January 2017, heading out on a 2-month expedition to unlock the secrets of Antarctic ice sheet response to past, present, and future climate change. The team met the smallest extent of Antarctic sea ice recorded in the past 20 years. The team, whose members hailed from Italy, Great Britain, China, Croatia, France, Spain, and South Korea, met the smallest extent of Antarctic sea ice recorded in the past 20 years. This unusual circumstance provided the rare opportunity to circumnavigate the Ross Sea and collect unique data in places that are almost always covered by ice and had remained unexplored. 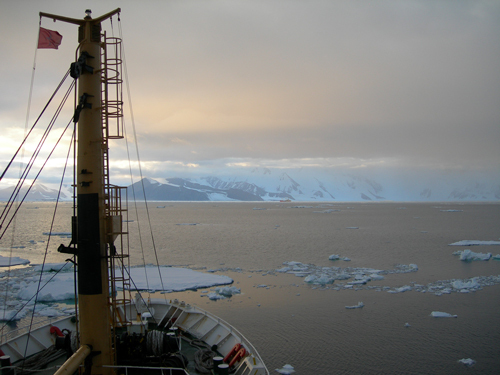 Funded by the Italian National Antarctic Research Program (PNRA) and the European EUROFLEETSproject, the scientists aboard the OGS Explora brought expertise in disciplines such as geology, geophysics, oceanography, glaciology, and climatology. 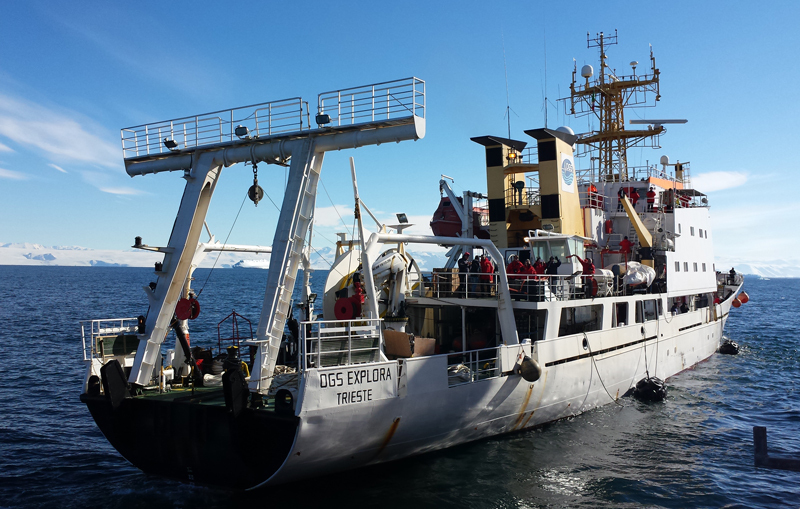 The vessel itself, owned by the Italian National Institute of Oceanography and Applied Geophysics (OGS), was on its 11th Antarctic expedition. Together, the ship-bound scientists sought answers to the following questions: What role does seafloor morphology play in the interaction between the Southern Ocean and the Antarctic ice sheet? Where exactly on the continental shelf do deep warm water, bottom water, and frigid ice shelf waters enter into and flow out of the basins? What does the morphology of the seafloor reveal about past ice sheet dynamics and ocean circulation? The Ross Sea feeds into the Southern Ocean’s Antarctic Bottom Water (AABW), the coldest and densest water mass in the world. As the seawater sinks, it ventilates and circulates the frigid waters of the abyss. The southern boundary of the Ross Sea is the Ross ice shelf—Earth’s largest body of floating land ice—which starts floating at the grounding zone of some of the largest Antarctic ice streams. For a schematic of water currents below Antarctica’s ice shelves and on the continental margin, see Figure 1. Over the course of 30 to 40 million years, sediments accumulating on the ocean floor below the Ross Sea were preserved in the continental shelf basins, recording the historical advances and retreats of the Antarctic ice sheet. The Ross Sea is therefore a unique natural laboratory in which we can observe both modern and ancient sensitivities of frozen water masses—our cryosphere—to global climate warming. There, scientists can collect data relevant to ice melting, ocean freshening, circulation strength, seabed erosion and deposition by ice sheets, and oceanic bottom current flow. The OGS Explora research team set out to gain a better understanding of the interaction between the Southern Ocean and the Antarctic ice sheet. 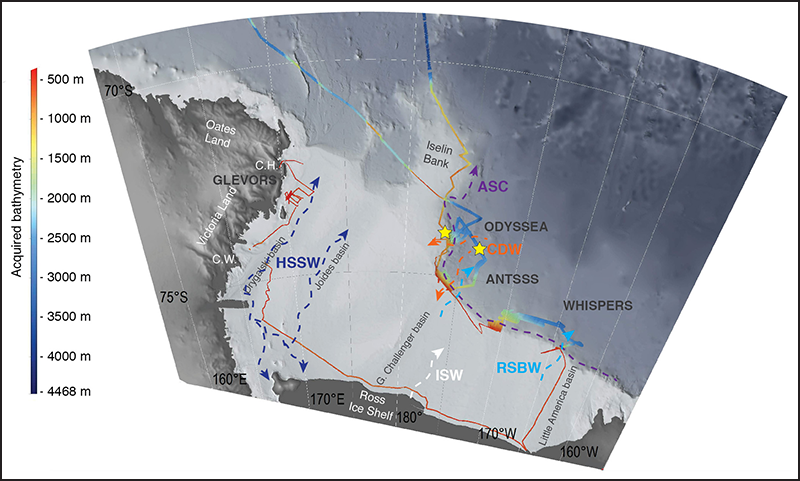 To determine the role of seafloor morphology in this interaction, we collected evidence for both modern and ancient glacier pathways, West Antarctic ice stream activity, and the flow of the Antarctic Slope Current (ASC). 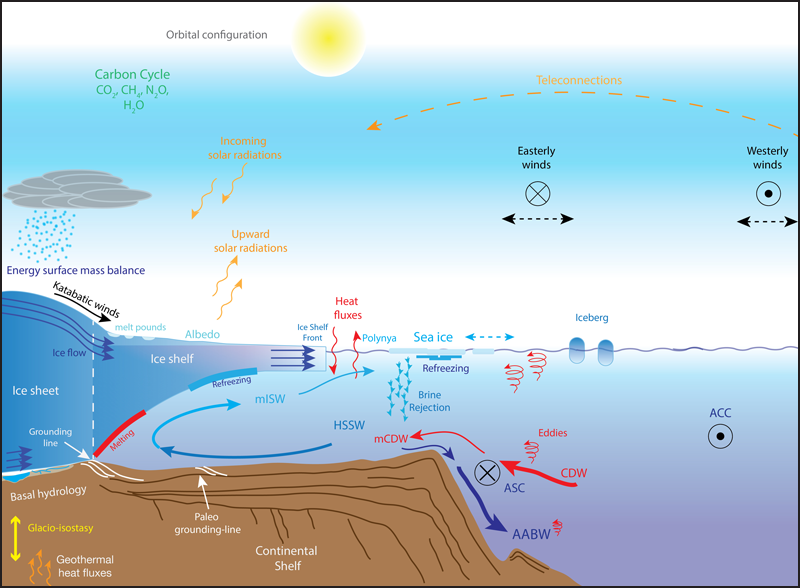 We also had other targets of investigation: to locate Circumpolar Deep Water (CDW) inflows to the continental shelf as well as Ross Sea Bottom Water (RSBW) and supercold Ice Shelf Water (ISW) outflows from the Ross Ice shelf (Figure 2). Capturing ocean processes at different timescales was complex and challenging. Previous studies [De Santis et al., 1995; Bergamasco et al., 2002; Anderson et al., 2014; Sauli et al., 2014] helped determine which sites to investigate. We measured ocean currents and water properties, and we located spots of water mass exchange across the edge of the continental shelf. One crucial part of the puzzle involved finding past imprints of these same ocean dynamic features in the sediments and paleomorphology of this continental margin. We used profiling tools to record multibeam sonar and subbottom chirp survey data from the seabed, in combination with acoustic Doppler current profiles (Figure 1). 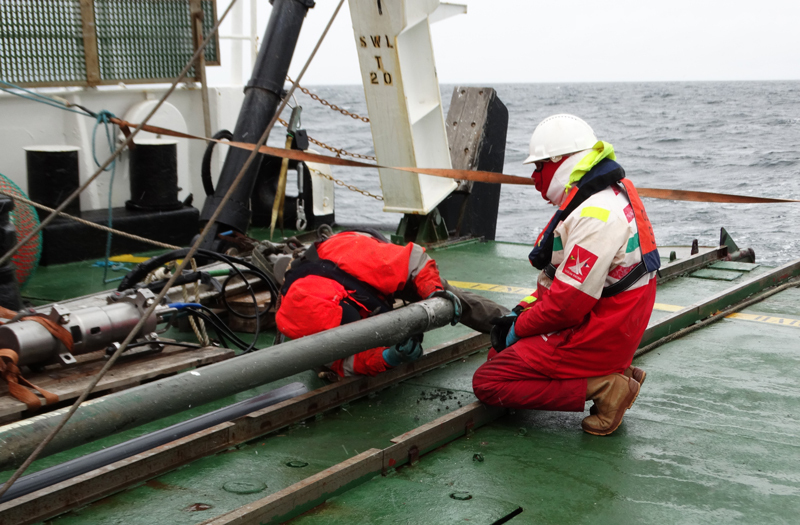 To measure oceanic temperature and salinity variations with depth, we carried out oceanographic transects across the continental shelf edge as well as along the front of the Ross ice shelf using expendable bathythermographs and temperature-conductivity-depth profilers. Reflection seismic profiles were collected near Victoria Land, across the continental shelf edge of Glomar Challenger Basin and Little America Basin, and at the base of the continental slope on the flank of Iselin Bank, where previous campaigns [Bergamasco et al., 2002] had captured the RSBW and ISW outflow and the CDW inflow. We observed wedge-shaped sedimentary landforms created by the advances and retreats of glaciers at the grounding zone between Coulman Island and Cape Hallett (Victoria Land). We also saw sediment drifts formed by bottom currents in a fjord, over shallow banks, and along the continental slope. We collected sediment gravity cores and box cores within these features. In addition, we studied key areas where the heat and salt exchange between the open ocean and the Antarctic ice sheet continues today as it likely has for millennia. We found that the supercold ISW outflow originates at the front of the Ross ice shelf at about 180° longitude. We measured temperature, outflow dynamics, and other water properties as the ISW spilled over the continental shelf edge, between the Glomar Challenger Basin and the Iselin Bank. Similar measurements were made to locate the ASC and CDW intrusions onto the continental shelf. The data tell a story hundreds of thousands—up to millions—of years in the making, revealing the interconnectivity among ice masses. We also imaged what looks to be imprints of past ocean dynamics and ice sheet meltwater pathways along and across the continental shelf edge, seen through seismic profiles and multibeam seafloor mapping (Figure 1). Preliminary analysis of the data revealed a variety of gullies along the continental shelf margin, possibly formed by changing hydrology patterns and different types of ice sheet flows, as well as by the exchange of ocean water masses across the continental shelf edge. The data recorded during this expedition provide insights into how ocean dynamics influences the depositional and erosional processes of the continental margin as well as the ice sheet–ice shelf interaction with the ocean. They tell a story hundreds of thousands—up to millions—of years in the making, revealing the interconnectivity among ice masses such as the vast Ross ice shelf and the Victoria Land glaciers. The data also reveal the evolution of the continental shelf, its interaction with marine and glaciological processes, and features of synoptic ocean dynamics. Such processes have affected the stability of the West Antarctic ice sheet for more than 5 million years [Naish et al., 2009], particularly during warm climate periods, when ice sheets probably retreated or collapsed [Pollard and DeConto, 2009]. The pioneering research initiated by the OGS Explora expedition is expected to launch a new generation of scientific projects. Data collected during the 2017 expedition were used to determine Ross Sea research sites for the 2018 International Ocean Discovery Program (IODP) Expedition 374. 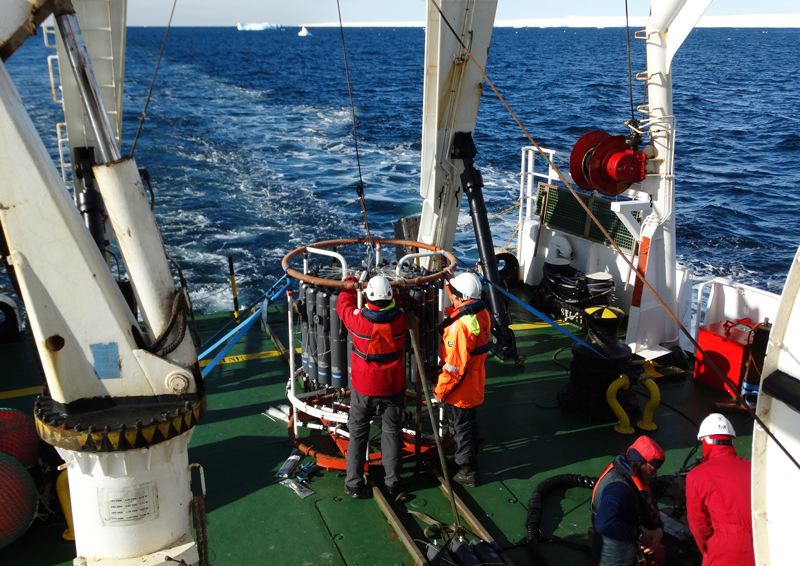 The 2018 expedition, which ran from 4 January through 8 March, collected cores and other data that will help those studying polar conditions to reconstruct the extent of the Antarctic ice sheet over the past 20 million years, during which Earth has undergone significant changes in atmospheric-oceanic circulation, atmospheric carbon dioxide concentration, and global temperature. Understanding how an ice sheet responds to global past climate fluctuations will help predict its vulnerability to ongoing and future global climate change. Observations from the polar regions, where the effects of climate change on the environment are amplified, are still too sparse. Subsequent expeditions can complete the seabed mapping and sampling and measure the water column changes that signal continental shelf-to-slope heat exchange processes, ocean water mass mixing, and ice sheet dynamics. The polar scientific community is eager to improve its understanding and predictions of climate system evolution—a fundamental step toward defining effective policy actions to mitigate potentially adverse effects of global climate change. We thank the PNRA and European EUROFLEETS funding programs; Captain Franco Sedmak and crew; party chief Riccardo Codiglia; the technicians and scientific party of the expedition; Laura de Steur (Norwegian Polar Institute); Liu Yanguang (First Institute of Oceanography, Qindao, China); Robert McKay (University of Wellington, New Zealand), IODP Expedition 374 cochief officer; and Luca Gasperini (Consiglio Nazionale delle Ricerche), principal investigator of the PNRA/Macquarie project in the Southern Ocean. We also acknowledge IHS Markit, Paradigm, Schulmberger for Kingdom, Echos, and Vista academic free license. Anderson, J. B., et al. (2014), Ross Sea paleo-ice sheet drainage and deglacial history during and since the LGM, Quat. Sci. Rev., 100, 31–54, https://doi.org/10.1016/j.quascirev.2013.08.020. Bergamasco, A., et al. (2002), Evidence of dense water overflow on the Ross Sea shelf-break, Antarct. Sci., 14, 271–277, https://doi.org/10.1017/S0954102002000068. Colleoni, F., et al. (2018), Spatio-temporal variability of processes across Antarctic ice-bed–ocean interfaces, Nat. Commun., 9(1), 2289, https://doi.org/10.1038/s41467-018-04583-0. De Santis, L., et al. (1995), Seismic record of late Oligocene through Miocene glaciation on the central and eastern continental shelf of the Ross Sea, in Geology and Seismic Stratigraphy of the Antarctic Margin, Antarct. Res. Ser., vol. 68, edited by A. K. Cooper et al., pp. 235–260, AGU, Washington, D. C., https://doi.org/10.1029/AR068p0235. Naish, T., et al. (2009), Obliquity-paced Pliocene West Antarctic ice sheet oscillations, Nature, 458(7236), 322–328, https://doi.org/10.1038/nature07867. Pollard, D., and R. M. DeConto (2009), Modelling West Antarctic ice sheet growth and collapse through the past five million years, Nature, 458(7236), 329–332, https://doi.org/10.1038/nature07809. Sauli, C., et al. (2014), Late Neogene geomorphological and glacial reconstruction of the northern Victoria Land coast, western Ross Sea (Antarctica), Mar. Geol., 355, 297–309, https://doi.org/10.1016/j.margeo.2014.06.008. Citation: De Santis, L., F. Colleoni, A. Bergamasco, M. Rebesco, D. Accettella, V. Kovacevic, J. Gales, K. Sookwan, and E. Olivo (2018), Exploring the unknown of the Ross Sea in sea ice–free conditions, Eos, 99,https://doi.org/10.1029/2018EO106159. Published on 11 October 2018.